China Fashion Week 2011: Deng Hao Haute Couture 2012 Collection. True Fashionista Now > Uncategorized > China Fashion Week 2011: Deng Hao Haute Couture 2012 Collection. 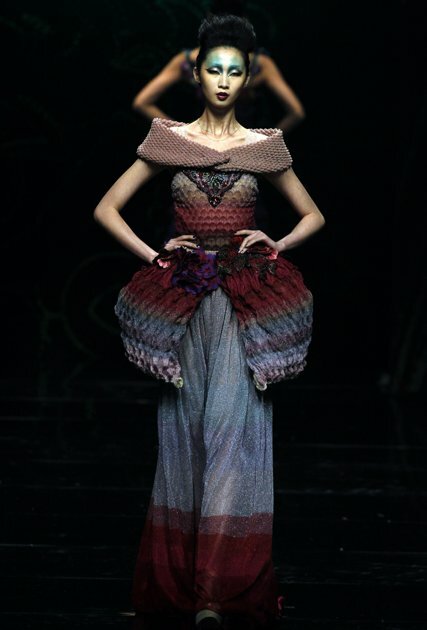 Holy fashionista, Deng Hao’s Haute Couture 2012 Collection at China Fashion Week 2011 in Beijeng is a sight to behold. The backdrop of cathedral windows with models sashaying in ruffled flamenco fishtail and ballgown inspired gowns is so dramatic. The color palettes of moss greens, burgundies and grays set a mood of fashion that is bold and a mood of upper echelon. Paris Fashion Week: Jean Paul Gaultier S/S13 Collection. LAKMÉ FASHION WEEK Winter/Festive 2011: Vivek Kumar. Volvo Fashion Week Moscow, Russia 2011: Sergei Sysoev S/S12 Collection.